The Brantford Food Bank could not operate without the generous food donations we receive. We rely heavily on the support of individuals, businesses, and community groups. Zehrs on King George Rd. Food Basics King George Rd. 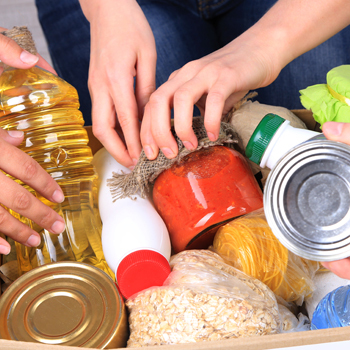 Food donations are also accepted at the Brantford Food Bank every Monday through Friday 8:30am – 11:45am and 12:45pm – 4:30pm. Please note that the Brantford Food Bank can accept fresh and frozen items at its distribution location during these times as well. Tax receipts are available if you provide a store receipt along with the goods you are dropping off. Interested in holding a food drive? If you or your business are interested in holding a food drive to raise food for our Food Bank, please contact our Food Procurement Coordinator at 519-751-4357 x238. For more information about holding a food drive, please review our Food Drive Guide.